Comics (or, less commonly, sequential art) is a form of visual art consisting of images which are commonly combined with text, often in the form of speech balloons or image captions. Originally used to illustrate caricatures and to entertain through the use of amusing and trivial stories, it has by now evolved into a literary medium with many subgenres. 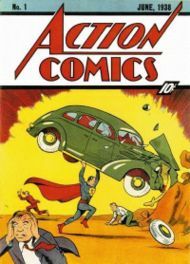 The most common forms of printed comics are comic strips (most commonly four panels long) in newspapers and magazines, and longer comic stories in comic books, graphic novels and comic albums. In the first two forms the comics are secondary material usually confined to the entertainment sections, while the latter consist either entirely or primarily of comics. Depending on the definition of the term, the origin of comics can be traced back to 15th century Europe or even as far as to Egyptian hieroglyphs. However, today’s form of comics (with panels, and using text within the image in speech balloons, etc. ), as well as the term comics itself, originated in the late 19th century.